Tough times for packaged consumer goods firms is not ending. Weak demand has been a bane but it looked like the worst was over. Demonetisation has dealt a blow to those hopes, at least in the near term. The remaining two quarters may feel the brunt of the decision, as consumers and the distribution channels adjust to the liquidity crunch. The BSE FMCG (fast-moving consumer goods) Index has declined 7.4% since 8 November, the day demonetisation was announced, but has recovered. The September quarter saw Hindustan Unilever Ltd’s sales volume decline 1%, as an increase in soap prices and withdrawal of promotions led to a decline in volumes. Oral care continued to disappoint, but others such as skin care, hair care and cosmetics did well. The silver lining about raw material prices increasing is that the bigger firms can manage this situation better than the smaller, unorganized ones. Godrej Consumer Products Ltd’s India business reported good sales growth as its household insecticides business offset a weak performance in soaps. Dabur Ltd, however, reported a 2.4% increase in sales although volume growth was 4.5%. ITC Ltd’s cigarettes business continued to do well, benefiting from a more moderate increase in taxes in FY17, with sales rising 7% in the September quarter, better than the 6% increase in the first quarter. Profitability improved, too. The consumer goods business’s sales rose 13%. Looking ahead, demonetisation will have a temporary impact on sales and profits. If rural demand recovers, the sector should do better in FY18, with the goods and services tax being a key factor to watch out for. Rising raw material prices lay the path for a gradual price-growth led recovery. Companies have scaled back promotions and even advertising spending, which should also contribute to better profit growth. 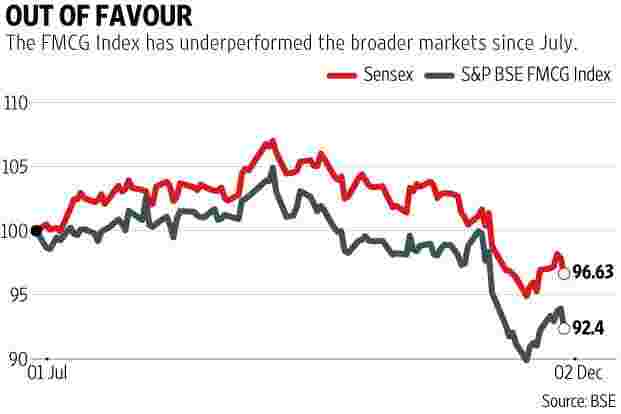 The sector remains expensive as ever, with the BSE sectoral index trading at a price to earnings multiple of 36.4 times trailing fourth-quarter earnings.